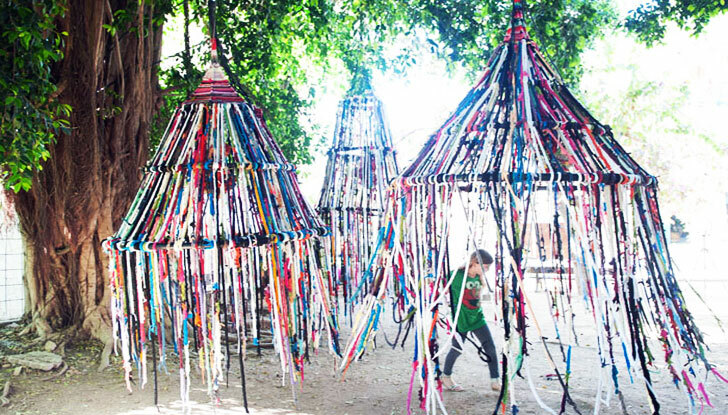 ‘The Tent’ is a spectacular installation located Zichron Yaakov, Israel, that was knit by kids, parents and grandparents who came together to create art. Every Wednesday for three months, the inspired group convened at the local community center to knit ropes from left over lycra scraps brought in from a factory. The ropes were tied to three nesting rings made of watering pipes to form circus-like tents. The tents were hung from a large ficus tree located in a public garden in the center of town. A space that was hardly ever occupied became a desirable place to be. 'The Tent’ is a spectacular installation located Zichron Yaakov, Israel, that was knit by kids, parents and grandparents who came together to create art. Every Wednesday for three months, the inspired group convened at the local community center to knit ropes from left over lycra scraps brought in from a factory. The ropes were tied to three nesting rings made of watering pipes to form circus-like tents. The tents were hung from a large ficus tree located in a public garden in the center of town. A space that was hardly ever occupied became a desirable place to be.